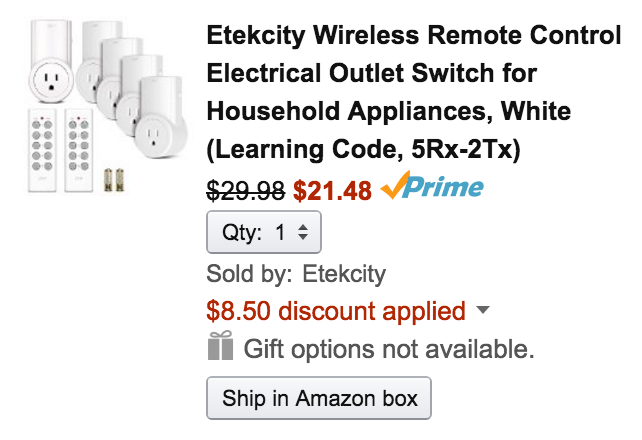 Etekcity (99% positive feedback from 50,000+) via Amazon offers a 5-pack of its Wireless Remote Control for Electrical Switches for $29.98. Applying coupon code P6OGMCD7 drops the final price to $21.48 with free shipping for Prime members or in orders of $49+. For a price comparison, today’s deal is a $18 savings off the original MSRP, down $8 from the regular going rate and a match of our previous low price. This Amazon best-seller brings remote control to nearly any product that uses a standard electrical outlet. It’s perfect for adding an on/off switch to lights around your home. This kit ships with five outlet switches and two remote controls (batteries included) that work within 100-feet over RF. Rated a collective 4.6/5 stars by nearly 3,000 Amazon reviewers. No need to get out of bed anymore to shut the lights off at night, or to turn on the AC or heater, just stay under your cozy covers and command your home with the touch of a button. During those midnight visits to the bathroom, turn the lights on before you have to feel your way around the room, and completely eliminate the risk of bumps and injuries. The constant need to unplug cords from outlets can make workspaces untidy and unsafe. The Remote Control Outlet Switch Kit lets you keep your devices plugged in and powered off when not in use, so rooms can stay free of clutter and fuss. Pre-programmed for immediate use, the kit allows users to activate appliances and electronics with wireless remote control.